New Release from Andy Statman: Superstring Theory! Part 1 of a wide-ranging, honest and informative interview with world class master musician, Andy Statman. Hislahavus: Mazel Tov on your release of the new album, Old Brooklyn! Can you tell us of the reaction so far in the secular and Jewish music worlds to the album? Andy Statman: There have been some good previews. “American Roots” is a nationally syndicated NPR program, so they’re going to do a feature on it. They do two hours – one hour with one artist and another hour with another artist – so I did an interview with them, and that’ll be [aired] sometime at the end of the year or early January. Generally there have been really good previews. In some cases, they appreciated the level of musicianship and musicality, but they were not used to hearing various combinations of instruments heard together. There’s actually been just one [written] review; the review did laud my playing, and say that there’s a lot of great music there, but you just have to sit down and listen to it. They felt it was worth the effort, but I guess their taste is more in easy listening music – which I think this [album] is anyway. It’s just a question of people’s taste and what they like to listen to. H: It seems that most of the niggunim you play on your albums are from Modzhitz, Breslov and Chabad. Is there something that draws you to those niggunim? AS: Aside from being niggunim that I like, these specific niggunim are ones that translate well into instrumental music. Some great niggunim don’t really make it when you play them on instruments, so the ones I play are the ones that work that way. In addition, what they call klezmer music is really instrumental Chassidic music. Ukraine is really the hotbed of klezmer music, as well as Galicia, so particularly for Chabad and Stolin, they’ve picked up that influence. Modzhitz as well, but they also had other influences. The composers in Chabad had a lot of breadth. Vizhnitz also has a lot – but you really have to get the right niggunim. Practically speaking, for Chabad and Modzhitz, a lot of their music is readily available. H: How does the non-Jewish world react to niggunim? How do secular artists, such as Bela Fleck or Ricky Skaggs, take to niggunim? AS: They enjoy it a lot. For Bela it has something to do with his own identity as a Jew on one level, and on another level, I think he likes the melodies. I think he enjoys playing them. He’s done a lot of different world music projects, so this is just another one, but this allows him to explore different types of feelings and different types of scales that he doesn’t usually work with so much, so it’s very challenging for him. Ricky is very moved by niggunim, but I don’t think he has really learned any. Bela hasn’t learned much of Jewish music on his own, but he enjoys playing it when we do it. But he plays in his own way. When I’m playing with him, I’m not looking for him to play a specific style, but rather for him to find his own way with the tune. I sort of provide the feeling of where it’s going, and Bela’s such a great musician he’ll just know where to go. H: Is there another musical art form that you would compare to niggunim? In other words, sometimes it seems that people are shocked by a niggun – they just have never heard anything like it. Is that true just of niggunim, or is it true in other areas of music? AS: Some niggunim, especially the longer ones, can almost have a stream of consciousness type of feeling to them, when there’s not a lot of editing or refinement of the melody and what it does and where it goes. It depends on the type of melody. If you’re not really acquainted with the type of melody, or with that Chassidic group, it’s really uncharted waters. Once you listen to it a few times, you begin to understand what the tune is doing. That being said, there are some melodies that are better crafted than other melodies. Not all niggunim are the same in terms of quality. Niggunim are set up to produce a particular type of feeling, and if you’re not privy to that, you’re not going to really understand what’s going on with it. There are many different styles of music that are different than niggunim, but maybe similar in the approach of the niggun of taking you somewhere. Someone who has no idea of, say, classical North Indian music, or Central Asian or Arabic or Turkish music, they wouldn’t really understand what’s going with this one scale and how they’re developing it – particularly in the slow, free, open parts that aren’t very rhythmic. The casual listener is not going to really know what’s going on or have what to latch on to. It’s not necessarily the fault of the singer or the niggun, it’s just that the listener has no experience with such a thing. I usually tell people that you really need to listen to a CD three or four times before you really have an understanding of what’s going on. You need to reserve judgment until you hear it a few times and understand what’s happening with it. But the truth is that niggunim are really a foreign language for most people. H: When you play a song or nigun, it seems that each time through, you add different stylistic embellishments and tweaks. Is this a conscious effort, or something that comes naturally? AS: That’s the just way it’s coming out of understanding the instrumental style that goes along with this and doing it for years. At this point it’s just the way I play the melody. It’s just the way the melody would be best expressed based on the instrument I’m playing by myself. The embellishments would be a spontaneous expression of something in the niggun itself the way I’m feeling at the time. It would be like any time a person who’s a good singer sings a melody, they’ll sing it differently every time – phrase it differently, or maybe add embellishments or ornaments based on that style that are applicable in the type of melody they’re singing. So it’s just something that happens spontaneously. H: There are a few nigunim you’ve recorded a number of times; e.g. the Breslover Lecha Dodi. Is there a reason for that? AS: Probably for the particular CD it seemed like it would be a good song for the particular ensemble that was playing and the market it was being geared to. H: That Lecha Dodi appears on Avodas Halevi and New Shabbos Waltz. AS: Avodas Halevi was one recording session done in the early 90’s that had never come out, and in it were mixed a bunch of live recording duets I did with drummers. It came from pre-existing sessions. As for New Shabbos Waltz, it seemed that during the ensuing years, the song picked up popularity and was being sung in all sorts of different styles of synagogues, so keeping with the conception of that record – which is pretty much songs that are accessible and better known – this seemed like a good one to do for the ensemble. So that’s why I did it there. The first time, though, I don’t know if it had ever even been recorded. (Benzion Solomon probably did a vocal rendition on one of the series of Breslover niggunim he did.) So we had done those sessions, and for various reasons they never came out, but when John Zorn asked me to put out this record, we figured this would be the perfect way to get these older recordings out, and it was right in line with what he was looking for. So that worked out. H: Can you tell us of your reaction when you first were introduced to nigunim, outside of their klezmer arrangements? From what I understand, you started getting involved with Judaism because you were searching for the source of these songs. Correct? AS: Well, so to speak. The klezmer music, which is either niggunim or melodies based on niggunim, was producing feelings that I began exploring. But I remember I heard some of the first instrumental music records that had come out, probably in the early seventies. They were either Chabad or a combination of Satmar niggunim and other Williamsburg-type niggunim. It was a very different style and type of melody than a lot of the klezmer music that I had heard growing up. But I liked it a lot, and it was only years later after playing klezmer for a long time that I began to realize that these melodies were if not actual niggunim – which a lot of them were – they were melodies that evoked the same feelings that niggunim do. They were set up that way. H: So you connected to them because of those feelings? AS: Yes. When I went to Hebrew School as a little boy, the rabbi taught us Alef Beis to a famous Alexander nigun, which I had no idea what it was as a kid, but it lifted everyone in the Talmud Torah. Everyone was in a state of ecstasy when we’d sing this song, which is what the niggun is supposed to do. As it turns out, it was a niggun written by the Alexander Rebbe in 20’s, for an Alexander-Modzhitz Chasuna. It was the famous one sung [to the words of Amar Rabbi Akiva V’ahavta Lereiacha Kamocha]. So that was probably the first niggun I really knew. But it certainly had a profound effect on me and the other students there as well! H: You’re involved quite a bit in teaching nowadays, and have written a few books that are considered influential classics. What would you suggest to a frum musician who is learning to play niggunim? AS: As a musician, it depends if they really want to learn how to play this vocal style in an authentic instrumental way. And if they want to do that, they need to listen to the klezmer recordings up to the 1935-1940, with few exceptions. But they really need to understand how these types of melodies were handled instrumentally. Once they’ve really mastered that, they’ll know how to take the vocal music and how to interpret it instrumentally. H: You picked two niggunim for your new CD, Sabeinu and Mah Yedidus. What led you to those two for this album? AS: Mah Yedidus is something I’ve been fooling around with for years because it lends itself to bluegrass; certain bluegrass techniques work very well with this tune. We’ve done it live and people have really enjoyed, so it seemed like a good one to record, and it came out nicely. Sabeinu goes by a lot of other names, and I haven’t met anyone who knows the origin of the melody. I’ve been playing it for years, and I knew Bela would like it. So I taught it to him in the studio. He’s very quick with these kinds of things, and it’s a catchy melody, and we had a good time with it. We gave it a little more introspective type of twist to it. H: You’ve worked with some of the most well-known artists in the music industry, both in the secular world as well as in the Jewish music world. What do you do when you approach a session for another artist? What did you attempt to do in your sessions with Mordechai Ben David on We are One and Avraham Fried on his niggunim CDs, specifically with Emes? AS: If I’m being hired, I generally do what I do. I was added [to those albums] for a certain type of color, so to speak. I gave them the color they were looking for; maybe not exactly the way they wanted [originally], but certainly in a way they liked, so it worked out well. Part 2 of this interview can be found here. You can get Old Brooklyn on iTunes, Mostly Music, Barnes and Noble, or anywhere. 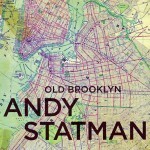 Visit www.AndyStatman.org for more information.